Every business knows that customer reviews and testimonials are branding gold. For businesses that deal with personal and emotional deals, like real estate investing, testimonials will help build a solid level of trust between you and your customers. Which is why you should be using video testimonials for your real estate investing business. 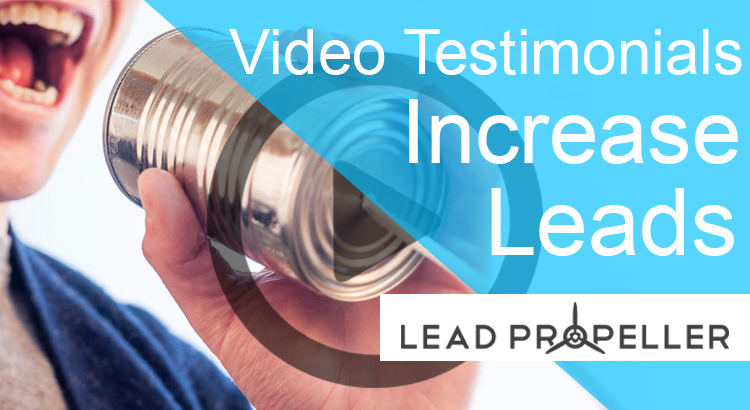 In fact, video testimonials will increase your leads! All testimonials are good for business, but video testimonials add another layer of consumable media for for clients. Before we get into the deeper marketing stuff, though, let’s talk numbers. Written reviews can be featured anywhere from your business’s FaceBook page, to Yelp, to BBB.org, to really any local citation directory. But we already talked about that in our article about local citations (which, if you haven’t read or don’t know anything about, you should go read up on that!) so we won’t go too far into detail here. The short version is this: yes, you absolutely need customer testimonials. Yes, they all need to be positive testimonials. This should go without saying, but don’t post or attach anything to your business that’s a bad review! That hurts your credibility and doesn’t give your customers any reason to trust you. So, please, only post the good stuff. Just to make sure we understand how effective testimonials are, here are some great statistics for you! As stated in the infographic above, videos “increase conversion rates by 86%.” That statistic covers all kinds of videos, from commercials to explainer videos to testimonials. Which, as we’ve talked about in our marketing strategies article, is very important for building your online presence and SEO. While all types of videos are higher converting than text, producing “3 times as many inbound links as plain text” according to NewsCred, video testimonials are the best thing you can have for your real estate investing business for a couple of reasons. Plain and simple. “65% of your audience are visual learners,” states WebDam. The majority of audiences are more respondent to visual aids like pictures and videos. And, for testimonials, videos are much more easy to digest. Think of your own experiences online, how many short videos do you watch instead of reading blocks of text? The same thing is true for your clients. [Videos] evoke specific emotional responses: joy, pride, sadness, anger, laughter, nostalgia, etc. These emotions fuel passion, and drives human behavior while building a brand relationship with an audience. This is because it’s much more believable to hear and see someone talking about how great your business is than just taking the word of some Yelp post. So, the more video testimonials you have the more your visitors will build trust in your business before they even reach out to you. By now you should be thinking, “shoot, I need some video testimonials for my business.” Don’t worry, it’s much easier than you’d think actually! Remember, we want to focus on authenticity. You don’t need a full production crew to make a video testimonial. These don’t need to be long videos, in fact shorter videos do better. Try to stick to 1 – 3 minutes long at the most. As far as filming goes, all you need is a recording device, like your phone or the camera you use to photograph your properties. As long as it has a decent mic in it, and you’re not shooting outside or in a loud room, that’s all you need. Right after buying a house from motivated sellers. This way, you can get their quick and honest response right after you’ve helped them solve their house problem. Right after selling a house to home buyers or other investors. This way, you can showcase the full scope of your real estate investing business and, again, get a quick authentic response from your clients right after doing business. The sooner you can get the testimonial, the better. You want to get your clients in a video when they’re at their happiest point with your service. The longer you wait, the more the happiness will wear off, and the less likely they’ll be to make the video with you. On your website is definitely the best place to post your video testimonials. First off, that’s where you should be redirecting traffic to anyway. More importantly, your website should be what shows up when people search things like “need to sell house” or “sell house for cash”. Because your website is where you want customers to go to, it’s obvious that on your website is the first place you should be featuring video testimonials. In fact, “Two-thirds of Twitter users said that they thought it was worth watching a video tweeted by companies and brands they follow” (Shootingbusiness.com). Plus, featuring video testimonials on your business social media pages adds to your online presence, which is never a bad thing. The more content you put out, the stronger your online presence is, the easier it is for Google and Bing to rank your business, and the faster you’ll be found in searches! Content is everything when it comes to building your business’s SEO. Search Engine Optimization is all about having material online that shows sources like Google and Bing that your business is relevant to searchers needs. Having optimized video testimonials linked to your business’s website on multiple platforms (YouTube, FaceBook, your website, etc.) will make your online presence stronger because you’ll be featured in more places. However, we understand that you’re a busy real estate investor and don’t have the time to optimize and post all the time. After all, you’re an expert at finding leads and closing deals! SEO takes time, both to build up but also to distribute. And, if we’re being honest, you have more important things to be spending your time on. That’s why our SEO professionals are here to manage your online presence and help build your real estate investing business’s SEO for you! Our experts will provide you monthly recaps on wins and analysis on opportunities that we address with your personalized service. Not to mention the amazing time saver this is. Our done-for-you approach allows you to spend less time behind the computer and more time closing deals!